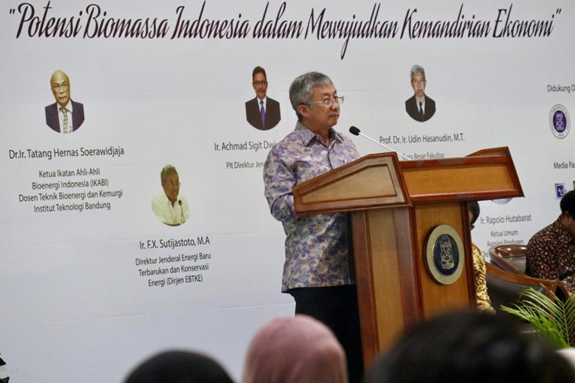 BANDUNG - The government hopes that all elements of the community will help build the bioenergy industry in Indonesia to support national energy security and sustainability efforts, this was revealed by the Director General of New Energy, Renewable and Energy Conservation (EBTKE), FX Sutijastoto, last Saturday (6/4) when became one of the speakers at the 2019 Chemurgy Innovation Summit Seminar organized by the Bioenergy and Kemurgi Student Association (HMTB) Faculty of Industrial Technology - Bandung Institute of Technology. "This bioenergy is our backbone to replace our dependence on oil, which has now diminished. Even though it has decreased from 50%, our production is only half," Toto said, as he was familiarly called. As an agricultural country, Indonesia's energy resources in the future are bioenergy and currently the Government together with related parties are developing the concept of industrial energy agriculture. "As a regulator, we facilitate how innovations from these universities enter the industry for conciliation, therefore the research must be pushed to the industry," explained Director General Toto. "According to research, the economy in Indonesia in 2030 can be number 5 in the world, so the opportunity to develop is very high, the consequence is that energy needs are increasing, so my focus is on energy security," he said. Toto also explained that the Government through the ESDM Ministry continues to strive to meet the energy needs of all Indonesian people to remote areas in order to realize equitable energy and in accordance with the National Energy Policy (KEN), including through Solar Energy Lamp Energy- Saving (LTSHE) programs in remote, outermost and isolated and the implementation of One Price BBM throughout Indonesia. At present the electrification ratio is 98.3% and is targeted to reach 99.9%. Meanwhile, Indonesia has also implemented the B20 Mandatory Program which indicates that Indonesia has bioethanol raw materials. This is where the importance of bioenergy because it can be used for electricity generation. The Director General of Toto hopes that students can innovate how to create an efficient generator so that it is affordable with local raw materials so that the procurement logistics costs are cheap.